• Sessions Announces "Religious Liberty Task Force"
Yesterday, Donald Trump's television lawyer, Rudy Giuliani, appeared on Fox News and CNN and claimed that colluding with the Russians is not a crime. Ipso facto, even if Trump did it, it is no big deal. He suggested that unless Trump paid the Russians for their campaign help, he didn't do anything wrong. This seems either to represent a new strategy or else is evidence that Giuliani has lost a few marbles along the way. Even Donald Trump has never argued that collusion with a hostile foreign power to swing an election is perfectly legal. He has merely said that he didn't do it. In his view, if crooked Hillary had done it, she would have committed treason. In a very narrow sense, "collusion" is indeed not mentioned in the criminal code (except in anti-trust law). However, it is a crime for foreigners to contribute anything of value (including information) to a political campaign, and helping a foreign government do so is certainly a crime, even if the name of the crime isn't "collusion." For example, if Donald Trump Jr. arranged to meet with Russian lawyer Natalia Veselnitskaya for the purpose of getting valuable information about Hillary Clinton, he could be charged with conspiring to violate election laws. And if Trump Sr. approved the meeting in advance, he would also be guilty of conspiracy. It is also possible that Robert Mueller might build a Racketeer Influenced and Corrupt Organizations Act (RICO) case against some members of the Trump Organization and/or the Trump campaign. If so, then Trump Sr. could be criminally liable for the activities of his organization/campaign even if he was not personally aware of them. Yet another possible crime in the picture is receiving stolen property, such as the DNC emails. There are plenty of others. It is too bad that Trump doesn't have much use for the United States' intelligence apparatus, as they would be able to clue him in on some important points. For example, that Kim Jong-Un's written promise to denuclearize plus five dollars will get you a cup of coffee at Starbucks. And that Kim not only had no intention of ceasing his activities, he didn't even bother to pause them for a week or two. On Monday, the Washington Post reported that the situation is even worse than it seems. Not only is Kim continuing his missile-building, he's aiming for bigger and better missiles. Specifically, sources within the intelligence establishment told the Post that satellite pictures show the regime's most important arms-building facility at work on one (or possibly two) ICBMs capable of reaching the United States. This is on top of the fact, already revealed several weeks ago, that the U.S. government has intercepted messages from the North Koreans in which they discussed their plans to deceive the Trump administration about exactly how many missiles they already have. So much for the nuclear threat being over. Any hopes that Democrats had that the Senate might reject Brett Kavanaugh for the Supreme Court suffered a big setback yesterday when Sen. Rand Paul (R-KY) announced his support for Kavanaugh. Paul objects to some positions Kavanaugh has taken, especially on surveillance and torture, but in the end he came around. With his vote now assured, Kavanaugh's confirmation is all but certain. Paul has a long history of announcing a mavericky position on issues, causing Republicans to panic and Democrats to get their hopes up. He also votes with the administration less frequently than any other Republican senator (about 74% of the time). However, he rarely pulls a McCain and breaks ranks on high-profile votes. And with Kavanaugh, it turns out that Paul was once again just grandstanding and will be a loyal vote for Senate Majority Leader Mitch McConnell (R-KY). Only Paul knows if he did it for publicity (maybe in anticipation of another presidential bid in 2024? ), or as a tip of the hat to libertarian-inclined voters in his state, or so that he might extract some unannounced concession from McConnell ("$10 million for new carpet in Louisville International Airport? Peachy!"). In theory, either of Sens. Susan Collins (R-ME) or Lisa Murkowski (R-AK), could buck their party and vote "no" on Kavanaugh, but that seems unlikely. They grandstand less than Paul, but ultimately, both are party loyalists. More specifically, Collins votes with Trump 79% of the time, and Murkowski does so 83% fo the time. That makes them less of a sure thing than, say, John Cornyn (R-TX; 96%) or Marco Rubio (R-FL; also 96%), but they are still pretty much in the bag. Particularly on a high-profile matter like this, when the pressure not to break ranks will be enormous. If they do waver, McConnell will promise them the sun and the moon to get them back in line. Maybe they can get new carpet and new chairs for their states' biggest airports. If no Republians defect, that will ease the pressure on vulnerable Democratic senators such as Claire McCaskill (MO), Joe Donnelly (IN), and Heidi Heitkamp (ND) since their votes won't matter. This could allow them to vote for Kavanaugh to avoid having their opponents tar them as anti-Trump, which could be troublesome in states as red as theirs. The trial of Donald Trump's former campaign manager, Paul Manafort, begins today. Manafort is charged with 18 counts, including bank fraud and tax evasion. None of the counts relate to his work as campaign chairman. The judge in the case, T.S. Ellis III, has openly said that special counsel Robert Mueller indicted Manafort simply to put pressure on him to flip. If Mueller can convince the jury that Manafort indeed committed a variety of crimes years ago, he might yet do so—unless he receives a presidential pardon. If Manafort loses, he could go to prison for the rest of his life. On the other hand, if Mueller loses, the other people who are still on the fence or who are not cooperating are going to be much less likely to flip, so it is a high-stakes battle for both sides. Mueller, of course, is going to give this trial everything he's got. He has already unveiled a list of 35 witnesses he plans to call. One of those witnesses will be Manafort's former partner, Rick Gates. If Gates testifies that he worked with Manafort to help a Russian-puppet regime in Ukraine and they were paid $75 million for it, and then Mueller produces Manafort's tax returns and shows that none of Manafort's share of the loot was declared as income, the defense is going to have a hard time coming up with a rebuttal. Also of note here, Manafort lives in Virginia and Virginia has a state income tax. If Manafort is found guilty on the federal charges and pardoned, it is conceivable that Virginia AG Mark Herring (D) could charge Manafort with violating Virginia's tax laws. Presidents do not have the power to issue pardons for state crimes. Republicans have gotten comfortable with the idea that the Koch Brothers are basically a piggy bank they can crack open at election time. That is not as true now as it used to be. Case in point: Charles Koch has announced that he will not support (i.e., fund) Rep. Kevin Cramer (R-ND) in his run to unseat Sen. Heidi Heitkamp (D-ND), probably the most vulnerable Senate Democrat in the country. Cramer's sin is voting for the $1.3 trillion spending bill that passed in March. The Koch brothers think the federal budget is out of control and don't like blowing up the deficit even more. They want to hold Republicans accountable, and this is one way to show it. This decision doesn't mean that Heitkamp is out of the woods—far from it. Still, not having to contend with a barrage of Koch-sponsored television ads is obviously a huge relief to the Senator. If there is a blue wave this November, her seat is still salvageable, despite the fact that Trump carried the Peace Garden State by 35 points. John Kelly is Donald Trump's Chief Of Staff In Name Only (COSINO). He has no power left and doesn't even bother pretending that he is working for the administration. He spends the early part of the morning in the gym instead of in the office. When Kelly, a Marine general, was first hired, he tried to bring order to the White House, and for a short time it worked. But in the long run, it failed because the problem wasn't junior staffers not doing their jobs, it was the President going every which way with no plan and no idea where he was heading. Just as one example, Kelly tried to make all of Trump's phone calls go through the White House switchboard, so he could log and monitor them. Trump didn't buy that. As another example, he wanted to make First Daughter Ivanka Trump report to him. She wasn't too keen on that. Sessions Announces "Religious Liberty Task Force"
Speaking of Trump administration members who have fallen out of favor, Attorney General Jeff Sessions keeps on keepin' on, despite the fact that he and the President can barely stand each other, and that Trump has repeatedly humiliated him in public. Other men would have resigned long ago, but Sessions has his own personal agenda to carry out. He knows that his job allows him to do it, and he's decided that a little abuse from Trump is a small price to pay. We've seen nuns ordered to buy contraceptives. We've seen U.S. senators ask judicial and executive branch nominees about dogma—even though the Constitution explicitly forbids a religious test for public office. We've all seen the ordeal faced so bravely by Jack Phillips. In short, we have not only the freedom to worship—but the right to exercise our faith. The Constitution's protections don't end at the parish parking lot nor can our freedoms be confined to our basements. The preeminent book written on the Watergate scandal is "All the President's Men," penned by the two reporters who effectively broke the scandal, Bob Woodward and Carl Bernstein. 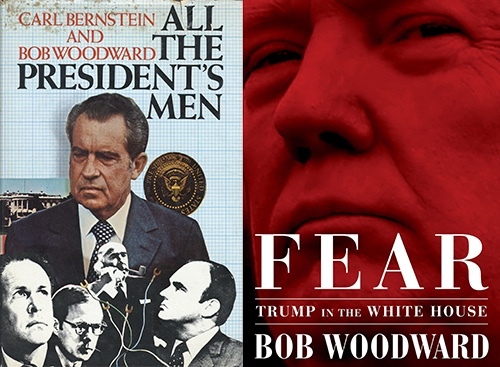 On Monday, Woodward announced that he's been working on a book about the Trump administration called "Fear: Trump in the White House." It will be available at a bookstore near you on September 11. Hopefully that date is just a coincidence. "All the President's Men" was some of the worst PR a president ever got, and many opponents of Trump are giddy about the possibility of lightning striking twice. Anything is possible, but there are going to be some pretty clear differences between the books (besides the absence of Carl Bernstein on the new volume). To start, the Nixon book was published on June 15, 1974, by which point the Watergate scandal was already full-blown, courtesy of the Washington Post and other outlets. While the book certainly did not help Nixon, it was more like the final nail in the coffin than anything else (he resigned seven weeks later, on August 9). Whatever happens with Trump, he's probably not weeks away from throwing in the towel, so the new book comes at a very different point in the process. Further, "All the President's Men" was as much about the Post's reporting of the scandal as it was about the machinations within the White House. "Fear," by contrast, is entirely about the inner workings of the administration. In other words, if it's ever made into a movie, there isn't going to be a role for Robert Redford.